Our commercial grade umbrellas are the perfect complement to your café or poolside location. Elegant and stylish yet strong enough to handle our extreme Australian weather. The perfect spot for customers to enjoy a coffee or a relaxing oasis of shade at your home. Custom built in our Sydney factory using premium materials and supplied with a ten-year guarantee. A smart option when you want modern design, rain protection, sun shading and a touch of luxury at outstanding value. Popular with cafes, hotels, resorts, business parks and luxury properties. 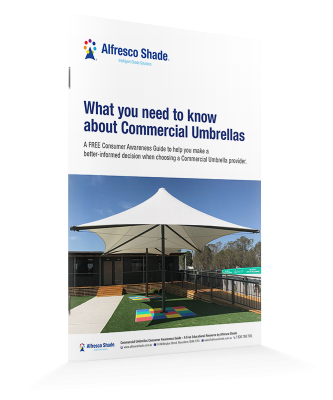 Find out why some of Sydney’s most successful hospitality businesses choose Alfresco umbrellas. What you need to know about Commercial Umbrellas. The timeless elegant design for commercial use. Stylish cost effective and so versatile. Clever cantilever design for maximum table space undercover. Perfect for street dining or poolside use. Bring the wow factor to your outdoor landscape. Great for business parks and convention centres.